Takashimizu history began in 1944 after merging of 12 small breweries during World War II. Thus far, we introduced eight families out of 12 which started their sake business during Edo to Meiji period. Time passed and it became Taisho period. It is said that from this period, Akita was recognized as a good sake brewing place nationally and expanded its market outside Akita prefecture. During Taisho period, the technical brewing skill developed dramatically. Originally, sake making was passed down from generation to generation orally or through the practical training. However, from the late of Meiji to Taisho period, new method based on science was gradually spreading nationwide through the lectures of the Brewing Society of Japan. Breweries in Akita took these lectures and improved those techniques suitable for cold region and shared them with Akita’s breweries. As a result of this, the performance of Akita’s sake at the national sake competition at that time was brilliant and it is said that breweries all over Japan paid keen attention to them. It was Mr. Masatsune Hanaoka called “Father of Akita sake” who built this foundation of Akita’s sake making and became the first head of Akita brewing laboratory. He established Akita’s low temperature and slow fermentation method which is suitable for Akita’s climate, spread the new brewing techniques, and trained the Toji (brewmaster) and brewers. With his brilliant knowledge, skill and the leadership, it is said that he committed to the development of Akita’s sake for about 25 years. 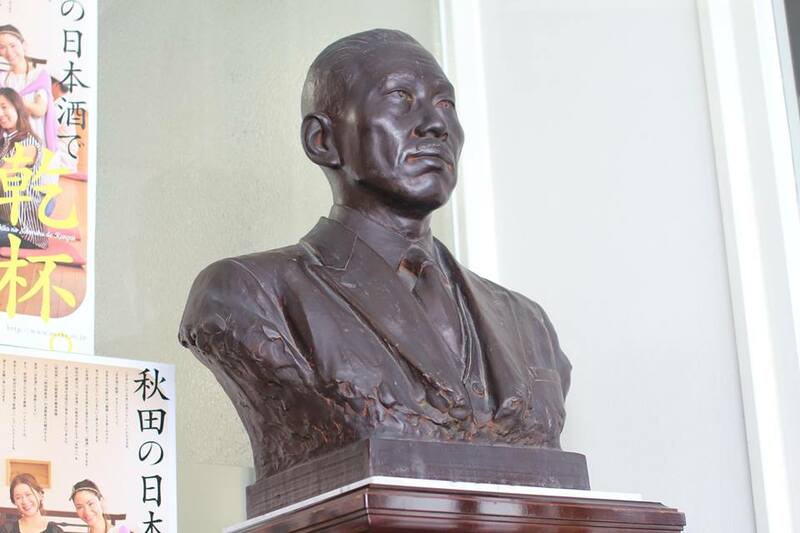 The picture above is the bronze statue of Mr. Hanaoka at the current Akita Sake Brewers Association. Thus, the time when Akita was to known as “sake country”, the rest 4 families’ history started. The establishment of Takashimizu is just around the corner, so please look forward to it over a glass of Takashimizu sake.